Where does Bluegrass end and Country music begin? 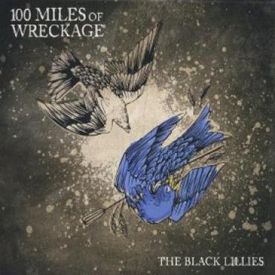 I’ve never been sure but when you listen to 100 MILES OF WRECKAGE you won’t care that the lines are blurred. The Black Lillies is the brainchild of singer and multi-instrumentalist Cruz Contreras from East Tennessee and this is the bands second album. Contreras has assembled a top assortment of players and every single one of them adds something special to this ensemble piece. The album opens with some fiddle and mandolin interplay on Two Hearts Down before Cruz’s warm baritone voice creeps up on you like Tennessee’s most famous export. On Same Mistakes; yet again Contreras voice adds an extra dimension to what should be a run of the mill break up song as his voice, the piano and guitars are all straight out of Laurel Canyon in the mid 70’s. Shepherd’s Song is a very simple love song with a hint of the religious about it and could easily be mistaken for Vince Gill at the height of his popularity. My favourite song on the album is probably Soul of a Man which also tips its hat towards Vince Gill but also JD Souther and even Alejandro Escovado. It has all the elements I love in Country music – a story, a great voice; slide guitar, a sweet fiddle and a melody. Soul of a Man is run a very close second by Ain’t Nobody’s Business when Cruz is joined not just on harmonies but equal lead vocals by Trisha Gene Brady who gives as good as she gets on this rocking duet. I could easily have listened to another couple of tracks like this as the two voices are just made for duets, just like Tim and Faith. If you like great Country music in the vein of Vince Gill, Poco or the very early Eagles you will love this album. I genuinely feel like Maverick has unearthed yet another treasure with the Black Lillies and I can’t wait until I get to see them play live.